However upon completing Technical School & opening my orders; the USAF with infinite wisdom had assigned me to Cape Canaveral Air Force Station (Kennedy Space Center) Florida. 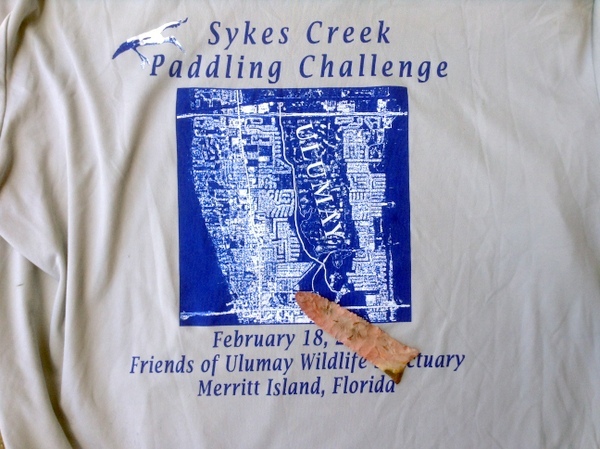 In a rather serendipitous fashion, the very first place I canoed after I arrived in Florida was Sykes Creek on Merritt Island, -to be precise, the Ulumay paddle trail. (I had no idea of the amount of Golden Orb spider webs I would have to duck and dodge on that trip) –as well as I had no idea that the Ais Indians had once made the Sykes Creek area their home. 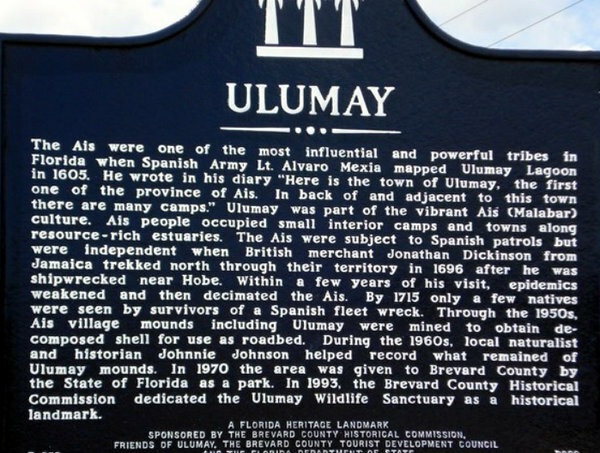 In the following years and into this century, I learned of the fierce Ais Indians who had claimed the Indian River Lagoon as their home and one of their major towns was "Ulumay" on Sykes Creek. 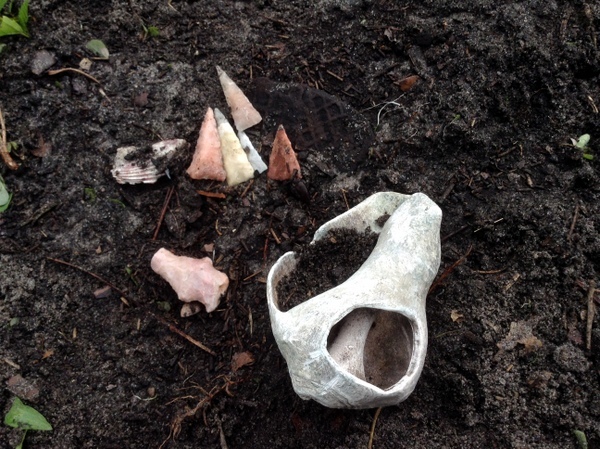 I took an archelogy course at the local college taught by Archeologist Bud Knoderer who in the class passed around 15,000 year old ice age spear points that had been dredged from the bottom of-- Sykes creek no less. I began to comprehend that this creek was a rather special place. On Google maps, you can still trace the channel of the ice age stream that once flowed in the area, attracting game and ancient peoples. A “Paleo Stream” as I named the ancient Sykes Creek. In the years following, I returned to Sykes creek often to canoe and eventually kayak. 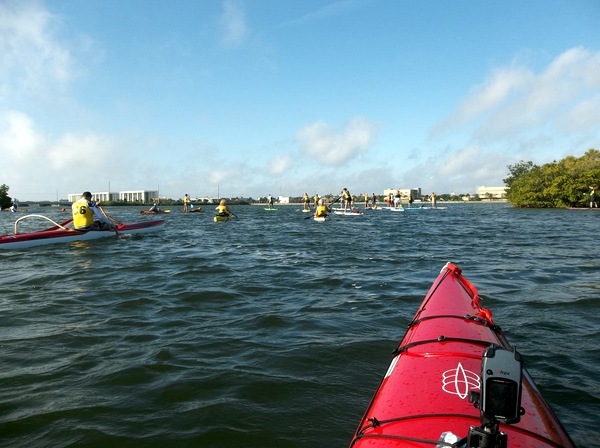 Sykes creek was the reserve paddle location during rough weather on the Intercostal Indian and Banana Rivers. It is obvious why the native Americans of the Space Coast chose Sykes Creek as the site for one their major towns-they could still fish and harvest oysters or clams during the roughest of storms that sweep the lagoons now and then. Paddling Sykes Creek at night, I learned of the Bioluminescence- a spectacular underwater light show and the fishing is pretty good. In other words, less worries about getting hit by drunken boaters when paddling on Sykes Creek or the Barge Canal. I still paddle the Barge canal at night, following in the wake of slow moving boats-the water churned blue green from the Bioluminescence. MR340 practice: Once I had decided upon entering the world’s longest non-stop kayak race, the MR340: I discovered that Sykes Creek was the perfect night practice spot.—low speed by boaters and incredibly sheltered from any winds except out of the due north. However the East-West Barge Canal “is” sheltered from the north winds. So the combination of creek and canal makes for great practice-if only for twelve miles or so. Sadly, as the Algae Blooms that began to sweep the Indian River Lagoon a few years ago; Sykes Creek became the harbinger of what to expect. --Fish kills come early and often to this Creek as the IRL, North America’s most diverse estuary slowly dies. Often the first word of a new algae bloom is the fish kills that spread up Sykes Creek and then east and west into the Indian and Banana Rivers. 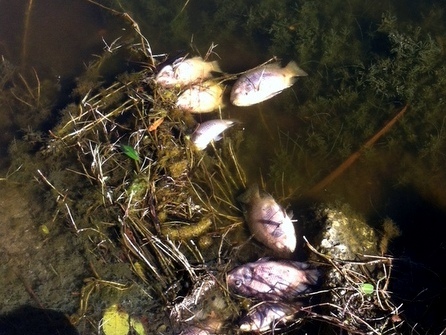 Why does Sykes Creek get hit so hard with blooms and fish kills? One only has to look at the housing developments constructed on the edge of the creek and the numerous canals from deep into Merritt Island. The happy and oblivious home owners can been seen on weekends eagerly spreading yard fertilizer on their 60’ x 60’ lots. Gotta have that striking emerald Greek yard-right? The homes and the canals drain into the ancient waters of the Ais Indians- Shell middens along the creek can be dated to at least 4000 years of Ais habitat. Now however, I’m not sure one family of Indians could feed themselves from this damaged Creek. Still Sykes Creek is sheltered. It is still a fun paddle. And we have entered at least two kayak-stand-up races put on by the “Friends of Ulumay” Fun races on the creek that you could paddle for free at anytime, however it does not hurt to contribute a few dollars to a good cause. 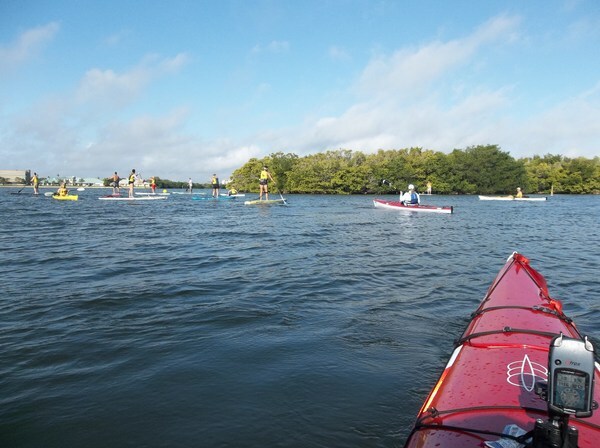 For a little longer distance paddle, launch from the Beachline (528) into the barge canal and paddle to the entrance of Sykes Creek. 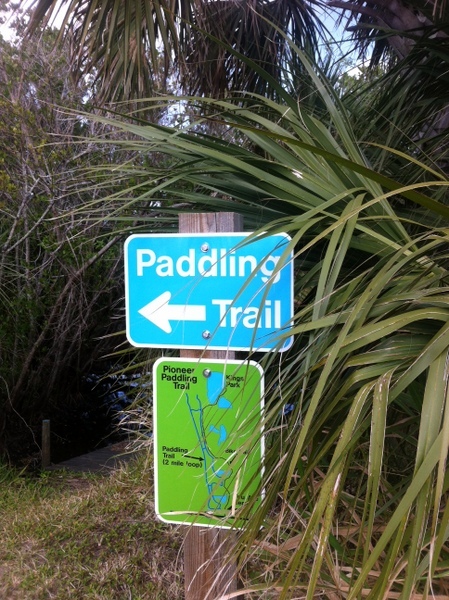 For a little more adventure and smaller water: There is a canoe/kayak trail established in the head waters of Sykes Creek off of Hall Road- North of the Barge Canal. 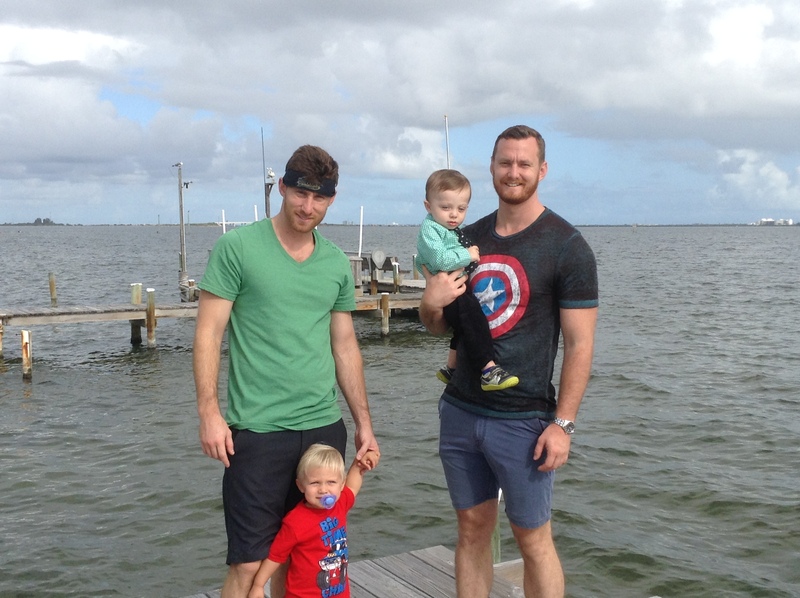 Pretty neat paddle with excellent snook and juvenile tarpon fishing!